Template includes designs and illustrations of the Five Forces Analysis. 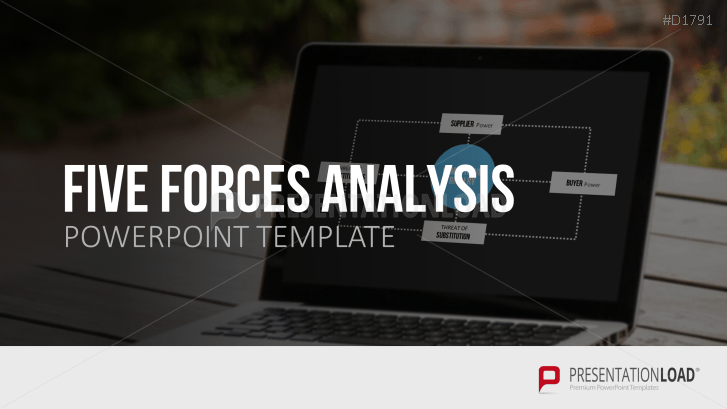 The Five Forces Analysis in this PowerPoint template set is used to determine a company’s attractiveness in its specific industry. The Five Forces Analysis, by Michael E. Porter is a model which bases specific industries on five factors. A company can use this model to develop strategies to enhance the attractiveness in their own industry. Moreover, they can use this analysis to assess opportunities and risks of expanding to other industries. The model is based on the idea that every industry has five external forces which influence the attractiveness of each industry. These reflect the companies at the center of competitive rivalry, new company entrants, the negotiating tactics of customers and suppliers, and the risk of new vendors and replacement products. By analyzing all the factors, it is possible for the company to reach a deeper understanding of the structural features of their specific industry. Use the templates meet with your team, evaluating and discussing the industry external factors (competitive rivalry, threats by new company entrants and of replacement products, and bargaining power of suppliers and of customers) in detail such as with expertise, cost savings, customer number, order volume, supplier number and size, power exchange, cost amendments, etc. Recognize both risks and opportunities relating to the development of a new industry and learn to assess the company’s future profitability in the current industry. You can use this model to develop strategies to enhance the attractiveness in your own industry. Great design!